Bug fix: mrphoton's noted instability has been fixed. Extensive sourcecode cleanup for increased stability and more responsive execution. looking at the release date, this looks like a tiger-era patch. i just tried it in leopard, and the patch created itself on screen, but on trigger no sound came out. ...i used speech synth as part of the hillegass cocoa book, dating from 10.3, so i guess its something silly thats stopping this from working as opposed to some huge synth api change. Most of our tiger patches don't work in Leopard out-of-the box because of some subtle internal api changes in QC (we've since learned how to make plugins more cross-platform friendly, but this, as you said, predates that research). the reason we haven't updated this patch is because of the built-in (or maybe sample?) plug-in that comes with QC leopard. If there's some obvious difference between the two, or you just think ours is cooler or something, let me know and I can spend a bit of time freshening the plugin for leopard usage. ...i forgot it was a leopard example, thanks. don't waste a second, there are far more glamorous plugins to work on! I really thought I knew QC better than this. Every time, I load QC it is not listed in the library. I can only get the stock mac speech synth: which just says the words. I cannot see the one as illustrated on top. I have tried making sure the folder names were good, even other plugins within the patch folder work, so it is for sure a working folder. Did anyone else have this much trouble? I have worked through my solutions from before and am stuck, I am not sure what could be causing this trouble. here is source to an official api speech synth that outputs phonemes like this patch. you will need to build the plugin for your computer. the example is a talking video. it doesn't have word output just phonemes as that is better for animation. however you could queue up the opcode output and then compare it to phonemes from your language model. see the list posted in the thread. if phoneme opcode "14" is followed by phoneme opcode "2" then that means the word "bat" has been spoken. this type of phoneme language model is how you do speech recognition as well. Thanks Dust, that clarified the opcode a bit, which is rather useful I must say. Definitely got that one to work. With that said, I was hoping for a bit of clarification on the Kineme SpeechSynth patch. Does this automatically convert the phonemes to words? If I you had any inclination that would be great. Not sure the system your running. I tried to build this speech plugin but it didn't show up. Seems to be a tiger era patch, that's way before my time. I'm thinking you would have to download the latest skanky sdk and the convert this plugin to be snowleopard comparable. You are just looking for the words output ? No the speech synth doesn't convert phonemes to words. It takes text input in the form of words then speaks and generates the phoneme output. Speech recog converts phonemes to words though ;). I'm thinking the word out put is just the word being spoken. To me the opcode is more interesting as I already know the words because I typed them in. I do however suppose it would be useful to know when a particular word is being spoken to then conditionally do something based on that info. I can add word output to the official sdk phoneme plugin I made. I'm thinking that may be a lot easier than trying to refactor this patch. 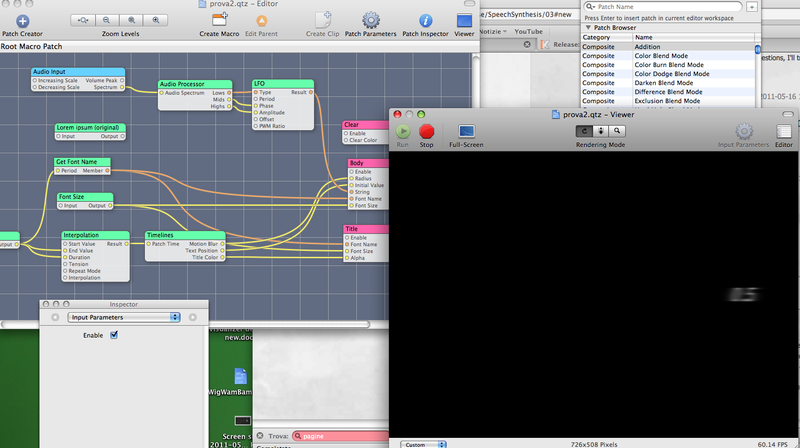 Shouldn't really be any trouble at all just got to add an output and query the speech synth manager. (edit) i had a look at the kineme patch here and i don't think it would function the way you want, meaning it is returning a number value for the words output much like opcode output. Some news regards the Leopard version for this patch? Suggestions on similar patches to use? Here's a universal build... it should work 32bit/64 bit, leopard or sl. I've only tested it in SL 64bit though. Works in both 32 bit and 64 bit . Quartz Composer visualizing -[what is built to do] - input data - in this case audio - [which it has in built patch support for the input of] - I prefer to use Kineme Audio Tools to capture audio and push data into the graphic patch setup to be visualized. If the audio is auto generated by Speech Synthesis , or input via a mic, then I think SoundFlower will provide a means by where I use QuickTimePlayer or Audacity to record via the SoundFlower. With an Audio Tools Audio Input patch to provide the audio data, in this case with a track running in iTunes, System Sound Preferences set to SoundFlower and the Recording preferences in QuickTime Player set to SoundFlower, Play the music, visualize in QuartzComposer and record audio in QuickTime Player. Funny thing is the composition visualizes , the track records and plays back , excellent quality of audio, works with SpeechSynthesis too, though a little clipped, still working to resolve that, but it records even though I can arrange matters so that the track plays to all apparent intent quite mute, still visualizes, still records. Putting this through a dedicated Audio Recording program is going to work better than what I've done, but with straight audio file playthrough with input and output set to SoundFlower, the QuickTime Player method has gleaned good results. Thank you very much for your suggestions, I'll try quick time to record and sound f. to pipe back the sound. you could also try audacity or garageband. I'm doing some test but... not yet good result. What about AU Lab? We have it as default on osx. I've attached an image showing that the audio input, with spectrum, etc. doesn't visualize the voice but numbers from 0 to 9 because is a 'string'. I think your a bit confused the audio input patches provide you spectrum data to visualize or create visualizations based on peak amplitude or audio spectrums. Which are provided in a mimetic format so you can hook the spectrum up to most things in qc. If you are wanting to visualize the voice as words or spoken words you will need the speech recognition patch. Or may have to make one of your own that suites your needs. Basically with the kineme recognition patch you add you words as a language model. When the word is recognized it gives you a Boolean truth value letting you know that it has detected your word in the language model. You would then use this Boolean truth value to trigger a synth patch to speak the word and also to trigger a sprite with a string to image patch on it that has the word from your model already loaded up to display the word. Thank you for the reply, Dust. Yes, with the kineme s. recognition patch you have to WRITE the words in order to create a model for the recognition. No way to bypass this model to write in Q.C.? I think no... just using Processing with the library VOICE. Anyway, as you can see from the comp. I've attached, it doesn't works, even if the multiplexer is BOLEAN. I've prbl. with the speakable itams, that, even if it is activate, doesn't recon. the words I pronunce. Thanks again, C.